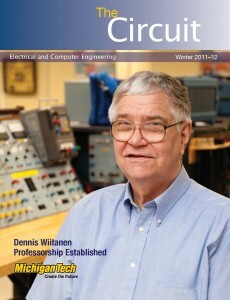 Computer engineering and computer science are both key to advancing knowledge of computing. The engineers focus on design and integrating software and hardware, while the scientists concentrate on analysis and the fundamental nature of computing. Now, with the enthusiastic support of the Department of Computer Science, the Department of Electrical and Computer Engineering is creating a space where Michigan Tech’s computer engineers and scientists can put their heads together. 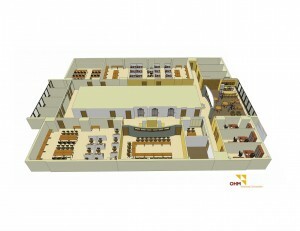 The new Center for Computer Systems Research will occupy the entire fifth floor of the Electrical Energy Resources Center (EERC). The Seaman Mineral Museum, a longtime tenant of the area, will be moving to a new building in the Advanced Technology Development Complex. Construction on the center is slated to begin December 1, with the opening expected in April 2011. The half-million-dollar renovation is funded in part by two $150,000 gifts, one from the James Fugere Foundation and the other from the Dave House Family Foundation. The remaining $200,000 is being underwritten by numerous smaller donations given to the department over the last several years. “The fact that this is made possible completely by alumni donations is phenomenal,” said Fuhrmann. Brainstorming for the new center began over a year ago, when Michigan Tech launched a strategic initiative to hire faculty in the area of computational discovery and innovation. Through the initiative, the department has gained two new computer engineering faculty, Zhuo Feng and Saeid Nooshabadi. “We started thinking about what we could do to reinforce the hiring initiative and our relationship with the computer science department,” Fuhrmann said. In addition, the computer engineering program was growing; with new master’s and PhD degrees, it needed more space. The Center for Computer Systems Research addresses all three issues. The new faculty are expected to be heavily engaged; Nooshabadi in particular will play a leadership role, since his research crosses the disciplines of electrical engineering and computer science. Preliminary plans include offices that can be used by faculty from both departments, informal meeting rooms, laboratory space, a conference room, space for graduate students, a seminar room, and even a kitchen. A department committee chaired by Senior Lecturer Glen Archer provided guidance to OHM Engineering Services in Hancock, which drew up the plans. 2) With his substantial publication record, even as a PhD candidate, Chao has already been frequently invited to review journal articles and conference papers for prestigious journals and conferences in the last two years. 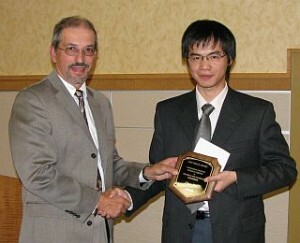 3) Chao has developed a ns-2 based software simulator for cognitive radio networks. This simulator will be released to the international network research community shortly. And we expect it will promote the reputation of Michigan Tech largely, as this will be the first ns-2 based simulator of its kind. 4) One of our NSF proposals that is based mainly on Chao’s research work has been ranked as “competitive” recently. Chao distinguishes himself as an outstanding PhD student researcher, not only by the quality and productivity of his research, but also by his “seeking-the-truth” research spirit. He often initiates constructive discussions among labmates, and he has become a role model for other PhD students in our lab.